Chefs were each required to present two dishes; one fish and one beef, in both elaborate platters and individually plated portions. 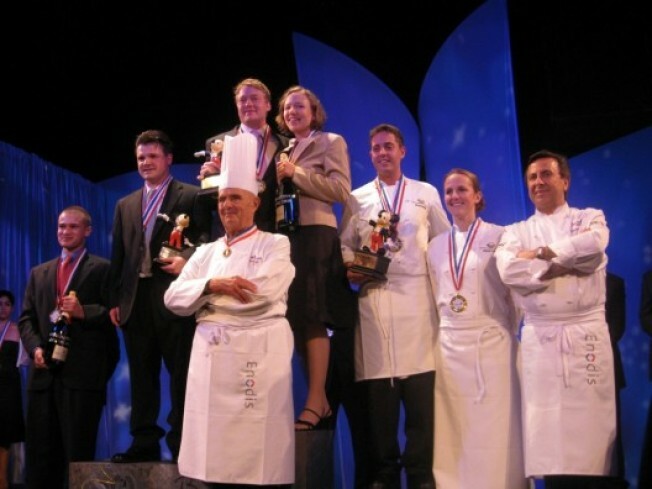 Presentation of plates comprised 50% of the contestant’s total score, determined by the following criteria each worth 10%- texture and cuisson (perfection in doneness), harmony of flavors, sophistication and creativity. Presentation of elaborate platters counted for 30% of the contestants scores based on the following three criteria, each worth 10%- complexity, technical knife skills and originality. Kitchen organization completes the final 20% and was comprised of 10% commis performance, 5% cleanliness and 5% efficiency in timing. Competition regulations required that the fish dish be prepared using cod, prawns and scallops with three garnishes. Hollingsworth presented Atlantic Cod with Hawaiian Blue Prawns and Sea Scallops. The dishes’ garnishes included Artichoke Gratin with Grilled Cod Belly, Hawaiian Blue Prawns, Piment d’Espelette and Nicoise Olives; Tomato Tart with Charred Green Onions, Sweet 100 Tomatoes, and Tomato Consommé en Gelée; with the third garnish Barigoule Bread Pudding with San Marzano Marmalade and Society Garlic Blossoms. Seafood for all contestants was provided by Pierless Fish Corp.